Searching for treasure and discovering new archaeological sites like Indiana Jones is every child’s dream. And this is exactly what Cadbury’s latest Freddo campaign sought to do. The relevant webpage listed a series of known archaeological sites in England, Northern Ireland and the Republic of Ireland where “treasure is fair game”, and encouraged children to get a metal detector and search for their own archaeological treasures. While this might at first sight seem innocent and have the advantage of getting children outside and encouraging an interest in the past, it was a heavily misguided and misinformed campaign. The resultant Twitter storm that erupted thereafter only served to prove this point. Unfortunately for Cadbury’s, searching for archaeological treasures is controlled and regulated by laws and guidelines: while this could give the impression of removing some of the romanticism of such an adventure, it is necessary to ensure archaeology is well recorded and available for the public. However, by failing to mention the laws and regulations that apply here, Cadbury’s left itself open to criticism from archaeologists and other heritage professionals. Thankfully, Cadbury’s has now pulled the campaign and is redesigning the campaign webpage. Aside from encouraging children to go out “and get their hands dirty” the campaign also monetised archaeological finds and treasure, for instance by mentioning the gold ingots found at Mooghaun Fort in Ireland valued at €150 million, thereby incentivising the sale of precious metal-based archaeological finds. As discussed previously on this blog, the selling of archaeological finds is frowned upon and can even be illegal, as is the looting of archaeological sites. Theft – under general principles of English common law, finds made on private land usually belong to the landowner, therefore their removal without the landowner’s consent would amount to theft. Furthermore, the illegal sale of such items could lead to prosecution under the Proceeds of Crime Act 2002. While the website has been taken down and Cadbury’s has issued a statement explaining its intention was never to have people “break existing regulations”, it is hoped that the company will consult with archaeologists and heritage professionals. The absence of research into heritage and archaeology in the creation of this campaign suggests a certain lack of respect and consideration of the work archaeologists and heritage professionals do with the public to make sure they are engaged with their past. The work of metal detectorists is valuable when reported. It is only a small few who disregard the law and this must be discouraged at all costs. 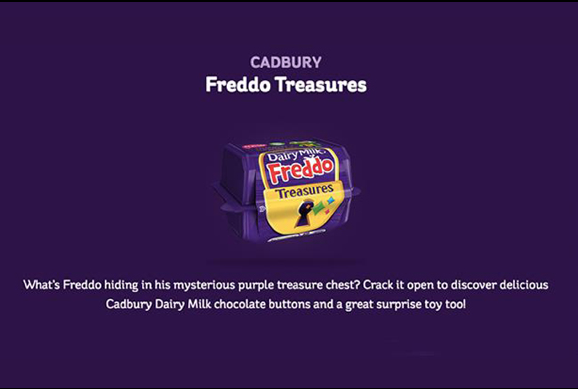 Images used of Cadbury’s Freddo box and campaign c/o Asian Trader and BBC (© Cadbury’s). This entry was posted in Treasure, United Kingdom and tagged archaeology, cadbury, cadbury's, campaign, england, freddo, law, metal detector, portable antiquities, scheme, scotland, treasure, uk, united kingdom, wales on March 27, 2019 by Rebecca Reynolds.